With nothing to interact with in this screen, I go north on the path and arrive at a new location… where I’m immediately attacked by a bandit! I don’t have time to react though because the bandit trips on a rock and sprawls across the ground, dropping his sword. I pick up the sword and do what any worth-his-salt adventurer, not to mention a teen lost in a fantasy world would do : I slay the unconscious and defenseless man and proceed to take his money. I’m not kidding. Notice the thumbs up makes the situation even more troublesome. I mean, I’m the not the kind to flinch over gratuitous violence. I love myself a good action movie where Arnie slays guys by the dozen and gets out of there with rewards, a medal and the girl. But here it seems a little… I don’t know… out of character? What kind of piece of crap would just kill a defenceless fainted guy? OK, I guess he was attacking me earlier but… well whatever. Everything is alright because he disappears in a bunch of little twinkly stars and not in a horrifying gush of blood. Anyway, I get the money and proceed to enter the city we see in the distance. Immediately after me, two guards appear in the path where I come from, rendering impossible any backtracking. I guess they’re looking for a ruthless murderer. 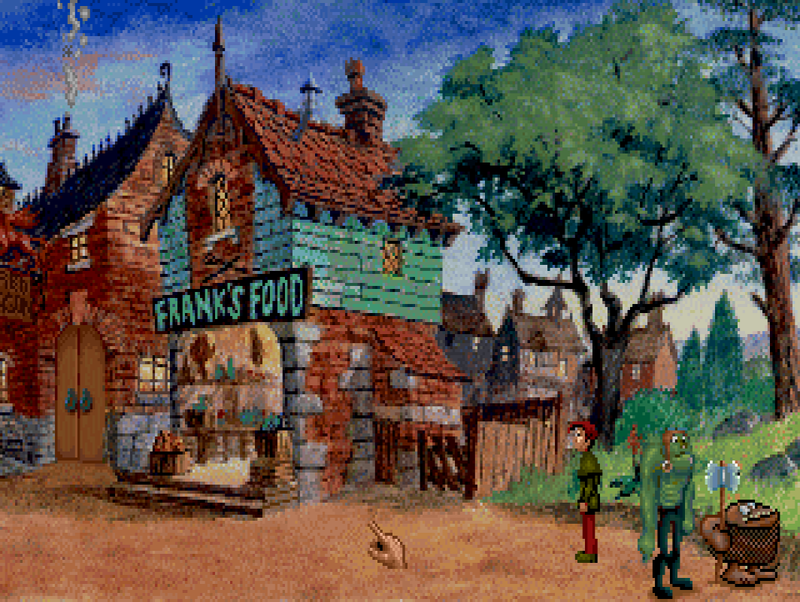 I start exploring the city, entering “Frank’s food” which seems appealing. Saying “Hi” to the butcher (Frank probably) shows me that he will sell me meat for money. I buy a roast with my loot. 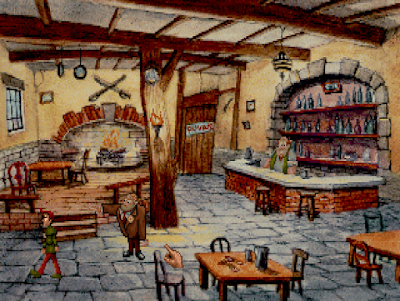 Right next to Frank’s place lies an inn, the Red Dragon, where the bouncer sends me back on my way, probably because I’m not dressed classy enough. First time I’m denied entry from an empty pub. The bartender seems to enjoy the lack of clientele. 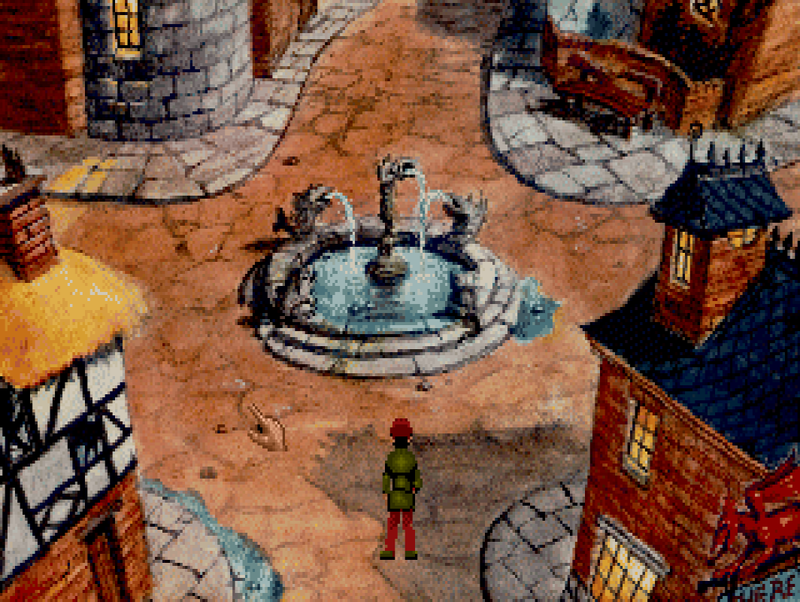 Going further in town I find a central fountain which I can’t seem to do anything with and three paths. 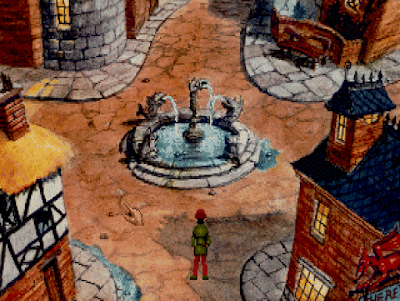 I start by going north of the fountain and find an alley with a magic shop, a derelict “joke shop” and a pack of sheep blocking the way ahead. Entering the magic shop, I find countless interesting artefacts which I can’t interact with in any way and a magician that seems to be willing to give me a spell for money. I kinda start feeling that there is a lot of missed opportunities for interactions in this town. The graphics are nice and colorful but it’s only to mask the fact that we’re just visiting empty places and giving money to random guys. But anyway I pay the magician and he teleports me on a cliff path somewhere. Well that seems a bit harsh, but I guess that’s what you get for paying people without asking what for. 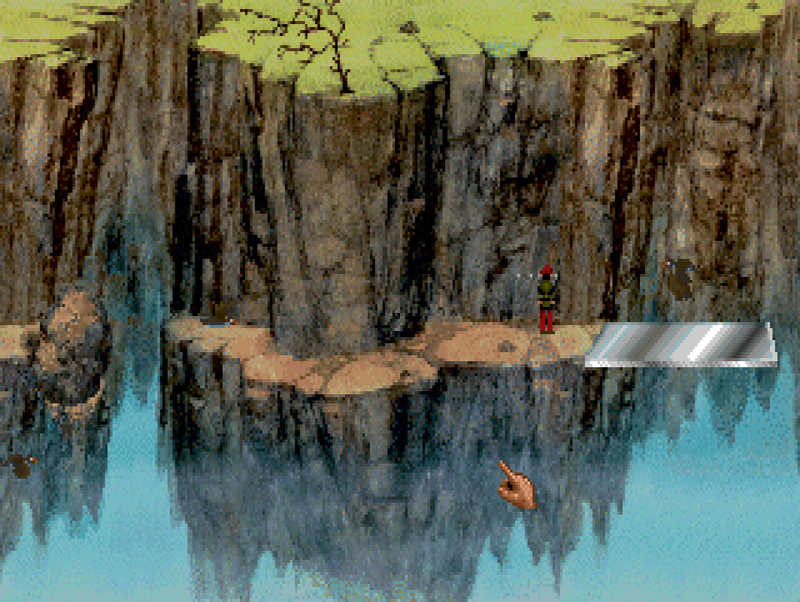 I’m guessing if there was a sign there telling “teleportation on a barren cliff over a bottomless precipice: 5 dollars” I might have given it a second thought. I’m pretty sure I’ve missed a lot of things in the city but I can’t seem to be able to come back for now. Well I guess I just have to trust the fact that I’m yet to encounter any dead-end so I’ll just keep going ahead and we’ll see where that leads. The speed of Brad on the path is excruciatingly slow and there is a flock of birds constantly going back and forth in front of us. Thankfully I can’t fall by going near the ledge, which is something the old Sierra games would have eagerly implemented. I arrive near a big rock and touch it… and fall down the bottomless pit. 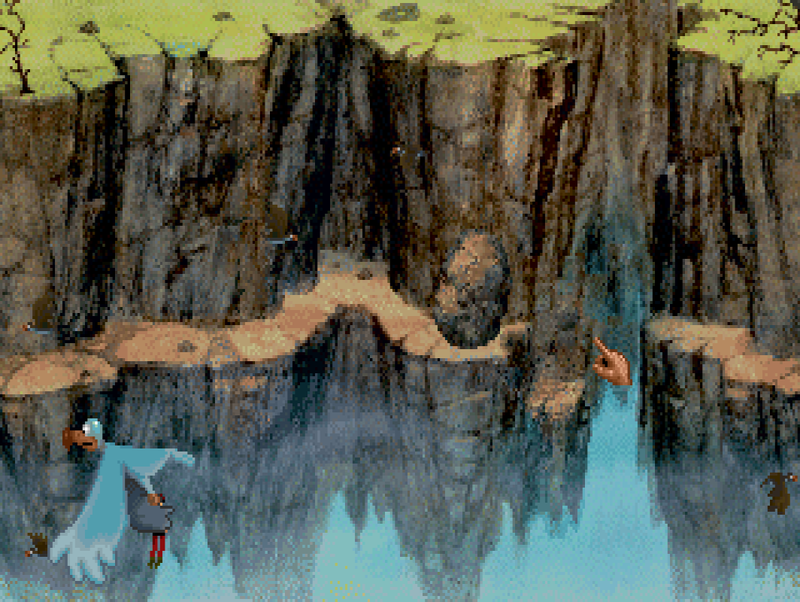 Well Larry… it seems you’ve plummeted to your death. Restore, restart, quit? 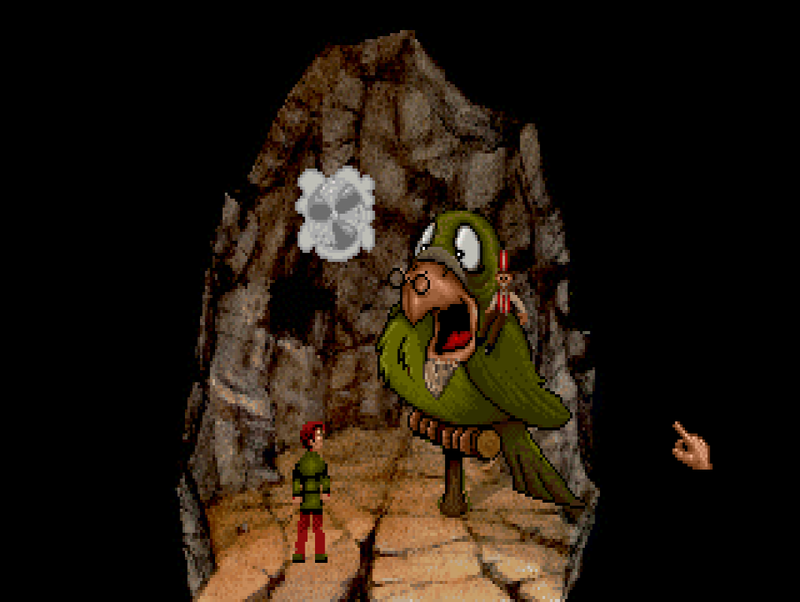 Not being in a Sierra game, Brad is picked up by some kind of giant pigeon? seagull? that brings him back at the beginning of the path. Thank you overgrown poultry! Let’s say he looks like a white howlibird. 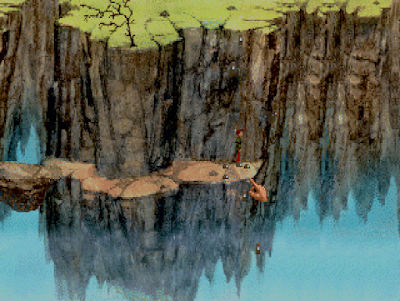 I go back to the big rock and, being careful not to go too close to it I push it on the ledge below. 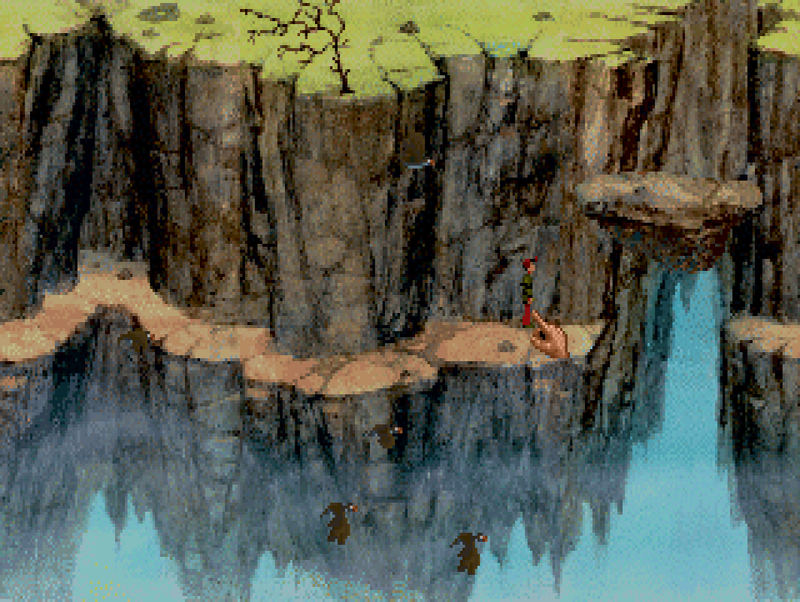 It then allows me to use the “jump” option and cross the gap. 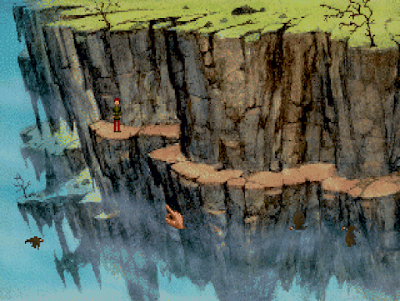 However I walk ten more steps on the path and get pushed over by a giant boulder that drops from above the cliff. I think you and me are going to be good friends. Going back to the big rock, I jump over the gap and pick up what appears to be a red blotch on the path. I pocket something that resembles a pair of red gloves and find myself in front of four switches in the wall. I press a few of them randomly but nothing happens. In a lot of games I would think that I missed a clue of some kind but I’m starting to know my Curse of Enchantia and try all the different combinations (which is not a lot to be honest). It seems that pressing the first, second and fourth switch creates a silver path to the rest of the cliff. Only the penitent man passes. 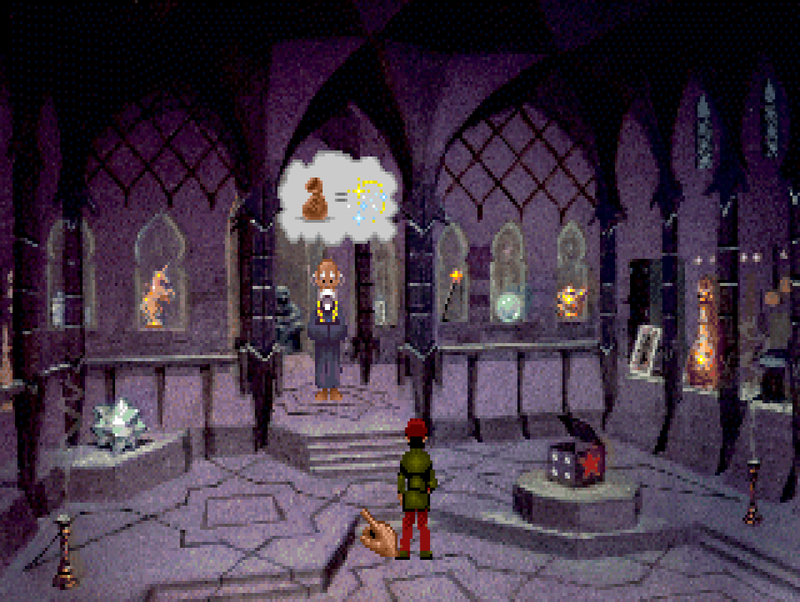 I’m starting to guess that maybe the wizard wanted to see if I was worthy of something, and has sent me to a path of trials in order to check if I really was the chosen one… but then again I paid the guy and the pigeon saves me everytime I’m in peril so maybe it’s just a cheap Disneyland knockoff. Visit Cliff Land! Its rocks! Its boulders! Its neverending flock of squeaking birds! … a little too much. After a pigeon trip (my feathered friend always takes me aaaaaaall the way back to the beginning of the path which makes it increasingly painful to go back to where I was before falling down), I go LESS near the sparkling guy and attack him with the rubber gloves. Because what’s one more death on my conscience? 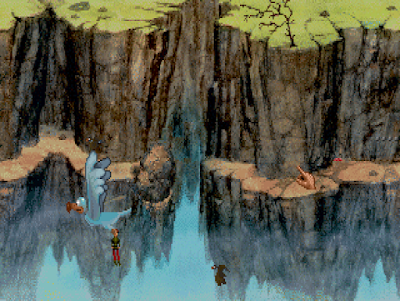 Right after that, the path is blocked by another falling rocks rain (which makes it the third time since the beginning of the game… what a nice display of imagination). This one comes back and forth though so I’m able to cross with good timing. You know what bad timing means : another pigeon flight. 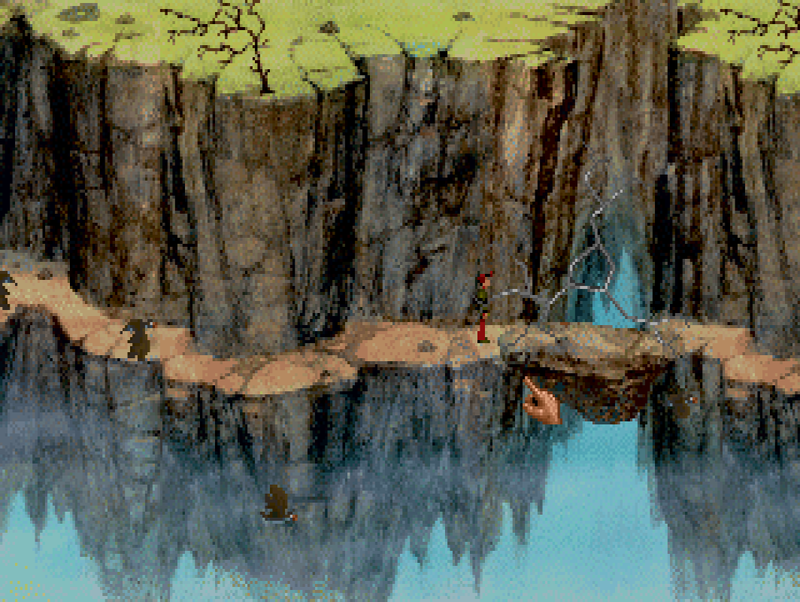 In one of two alcoves that allow me to get shelter from the falling rocks I find… another rock! Yay. A blue-greyish one too. What a pretty blue-greyish rock. I know it seems like nothing but after having seen a ton of rocks of all shapes and sizes, a blue one makes for a nice change of scenery. 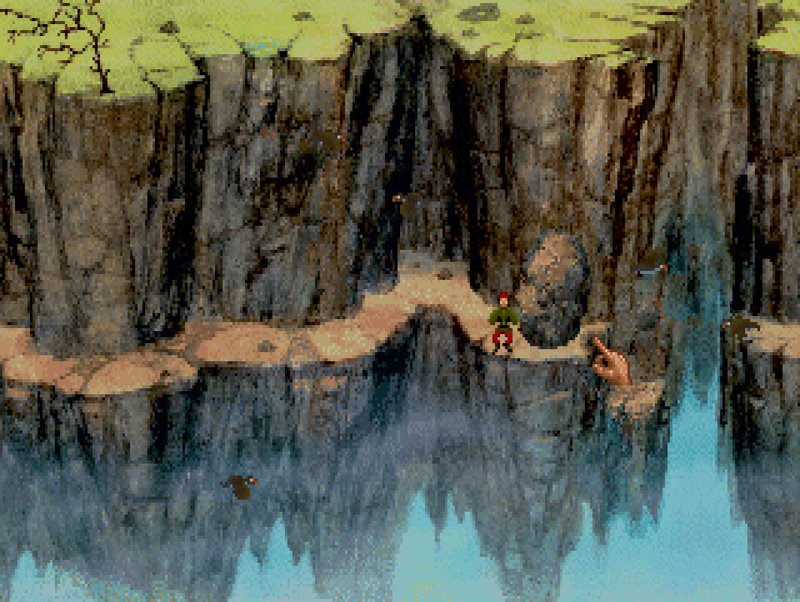 Going on on the path, I find another gap, with a huge rock above it. I try throwing my rock (and everything else in my inventory) but to no avail. I try everything on everything because the obvious thing I could do would be to make a grappling hook of some kind with the rope and the rock for example, or with the rope and the money bag… but no. 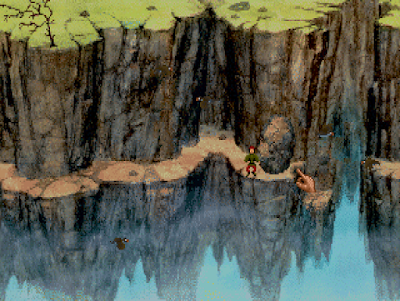 Something is weird there though, because there is a specific spot on the path where a rock is falling again and again just above my head. I’m trying to catch it or to interact with it in any way but I can’t get the timing right or there is nothing to do with it. And that’s it : the case I was afraid of is upon me. I’m stuck here with no obvious way of making any progress. I go back on the path to check if I’ve missed anything trying to look for every nook and cranny I could have missed but it doesn’t seem to be the case. I spend long minutes trying to do everything I think of with this stupid little rock falling over and over again, but nothing happens. Then, the cold hand of fear squeezes my heart : what if I was in a walking dead scenario? After all, the impromptu teleportation from the wizard didn’t leave me enough time to search for everything in the city… OK, that’s a reload for me. Exploring the rest of the city, the west path leads to a shack called “Sally See All” where crystal ball readings is given by a seal (which is a pretty funny pun I admit). The seal gives me three visual clues in exchange for money. So I’m guessing I was right with the Magic Shop being the first place to go to. 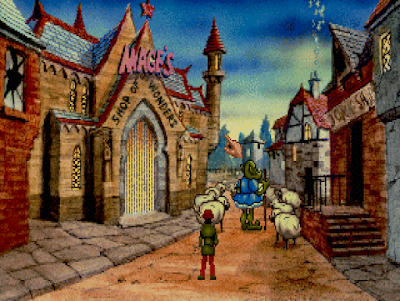 The second thing would be that I have to dress with a pig costume to pass the beetle guard blocking the street west. Then I’m supposed to find the costume shop. Seems the latter two are not in the correct order but let’s assume the seal is right. Going east from the fountain, I find the costume shop, with the street going east blocked by two mexicans sleeping (don’t look at me like that, the game is making stereotypical jokes, not me). 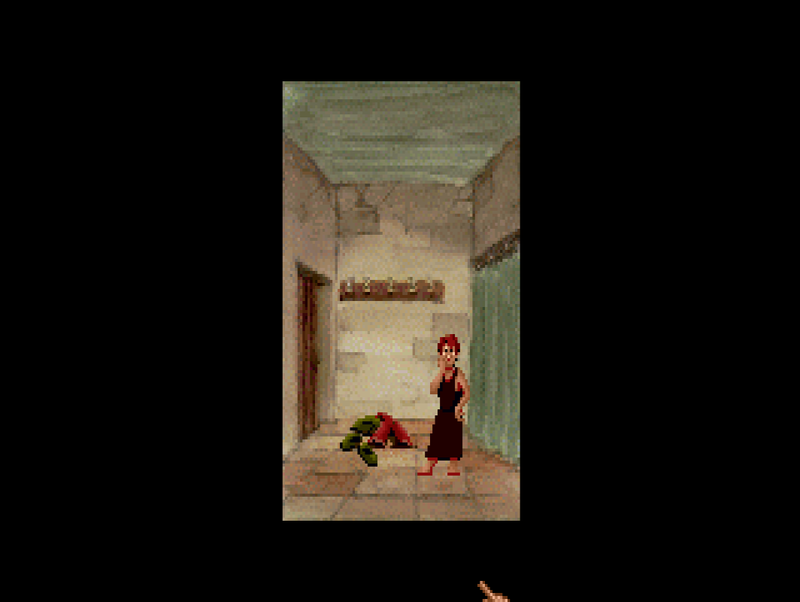 The costume shop is of course empty with nothing to interact with but I can enter the changing room in the back. There is a closed door there which I can’t open in any way (I’m guessing the door is paperclip-proof). And that’s it! I didn’t find any hook for my grappling hook, nothing much to interact with and except a few nice looking screens, I don’t have any more clue on how to proceed. 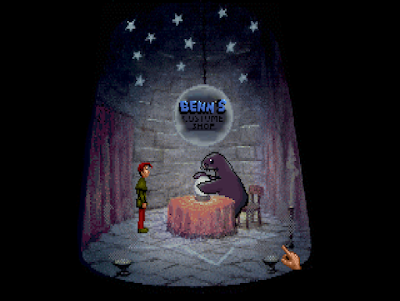 I did see something kind of reassuring though, which is that the seal’s predictions put the magic shop first. And so far, the game hasn’t put me in any walking dead situation so I guess I’m missing something on the cliff… aaaand this is where I realize that I haven’t kept any saves from the place I was on the cliff so it’s back to the rock and fall ordeal just to get back to the spot I was… I’d love to tell you that I didn’t fall down too much but it would be lying. On the plus side, killing that poor bloke one more times relaxes me a little. I will now jump in time a little bit to avoid telling you about all the things I’ve tried here. 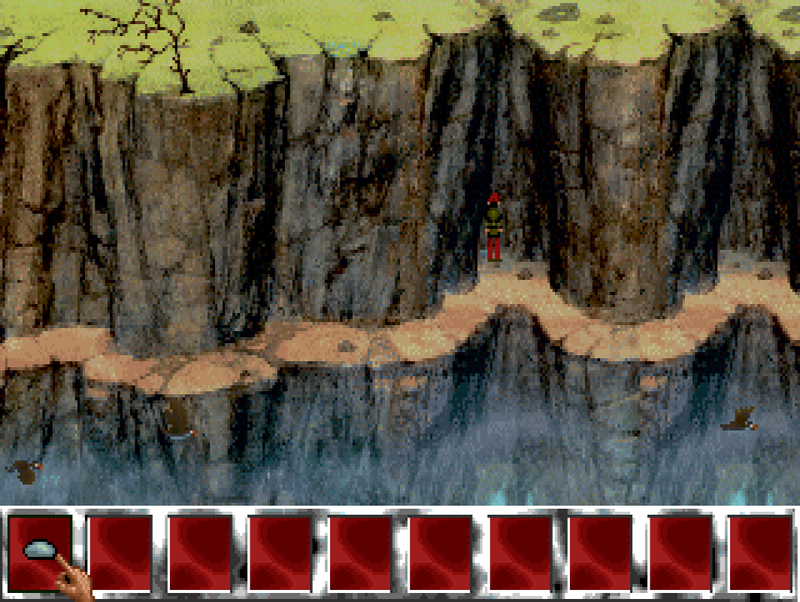 I spent several long minutes going back and forth this path, tried about everything that made sense to pass this gap. I cursed a lot. And then…I found it. 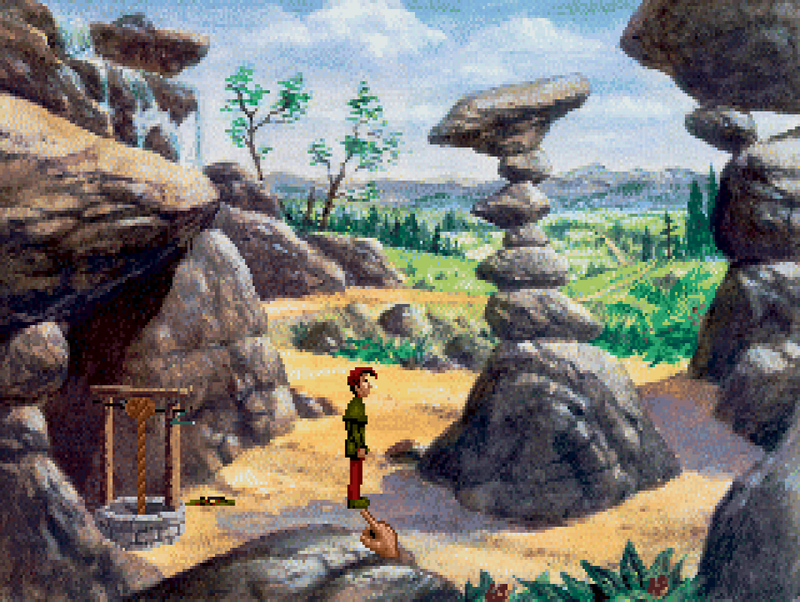 The worst thing about trying everything out of desperation in an adventure game is that when you finally stumble upon the solution, you feel relief. You’re grateful for the game to finally allow you to make some progress. You’re glad you can keep on playing. So all these feelings blind you from the truth : you didn’t solve the puzzle, you just brute-forced it by doing everything you could. And that is not good. Sometimes you feel stupid because you could have found the solution by yourself and sometimes not. So let me catch my breath here and tell you the solution. You have to WEAR the blue rock. That’s correct. 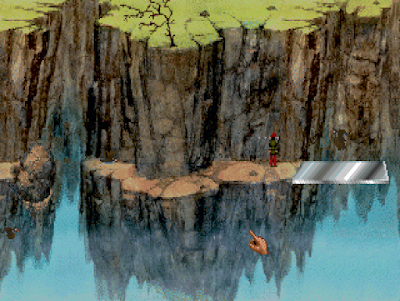 You have to use the option WEAR and select the fraking BLUE ROCK just while you’re below the little falling rock on the edge of the path. WHAT? I mean… excuse me… WHAT? Yes because when you ask Brad to wear the blue rock, he puts it on his head, which allows him to have the OTHER rock fall directly on his head so he can grab it. WHAT? Yes even telling you this way it makes little sense. 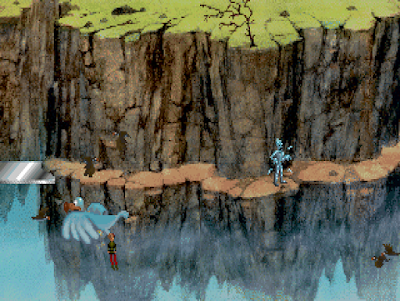 I have a theory though, maybe the blue rock is not a blue rock. Maybe it’s glue of some kind. Maybe it’s some kind of very badly drawn iron helmet… But even in this case, it means the little rock was falling on Brad’s head the whole time. Maybe if he said “ouch” or if he fell down when receiving the rock on his head it would have made me think “hey, I need something to soften the blow”. But no, the animation let you think that the rock bounces on the cliff above Brad’s head so in no way can you think you need to put something on your head to catch the rock. 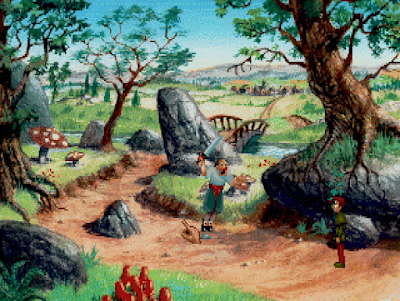 And then you can throw your new rock in the boulder to make it fall and complete the path. I’m sorry but I have to ramble some more. WHY OH WHY DIDN’T YOU USE THE FRAKING BLUE ROCK TO MAKE THE FRAKING BOULDER FALL YOU LITTLE PIECE OF… sorry. Deep breaths. I’m letting myself carried away there. I have only one thing nice to say about this puzzle : it makes the computer/counterweight puzzle in the last section almost seem like a nice clever puzzle. 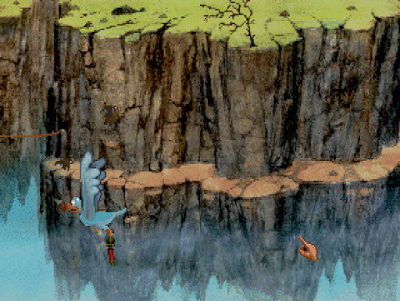 This part of “wearing the rock to catch another rock to throw at a big rock” might be the STUPIDEST THING I’VE EVER SEEN IN A VIDEO GAME. This is the kind of things that would have made me rage quit if it weren’t for the blog. This is the kind of things I can only talk about in caps lock. 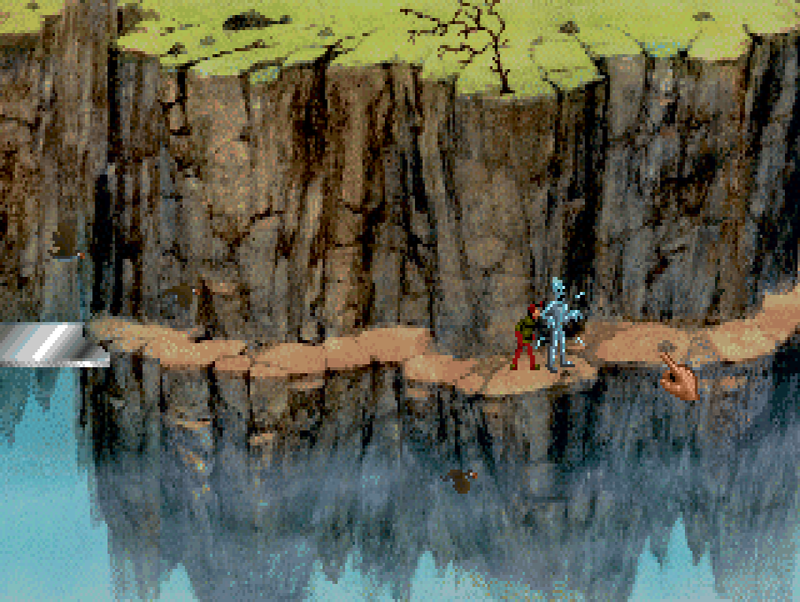 But anyway, let’s move on, my friends, to the rest of this fantastic cliff challenge. I walk a little bit more and find a place where several blobs, slimes or whatever drop down from the ledge above and jump to their death, lemmings-style. Weird but at least I don’t have to wear a frying pan to catch one. I try to do a lot of things with the little blobs, including using the rope because I thought I could lasso one. Using the rope makes Brad throw it above the gap and allows me to cross it. What were the little blobs and why were they here, tirelessly jumping to their death again and again? We will never know. And honestly I don’t even care anymore. I’m guessing they were trying to escape this horrendous universe in the only way they found. The RNG generator that makes the birds appear seems to have gone overboard on this screenshot. 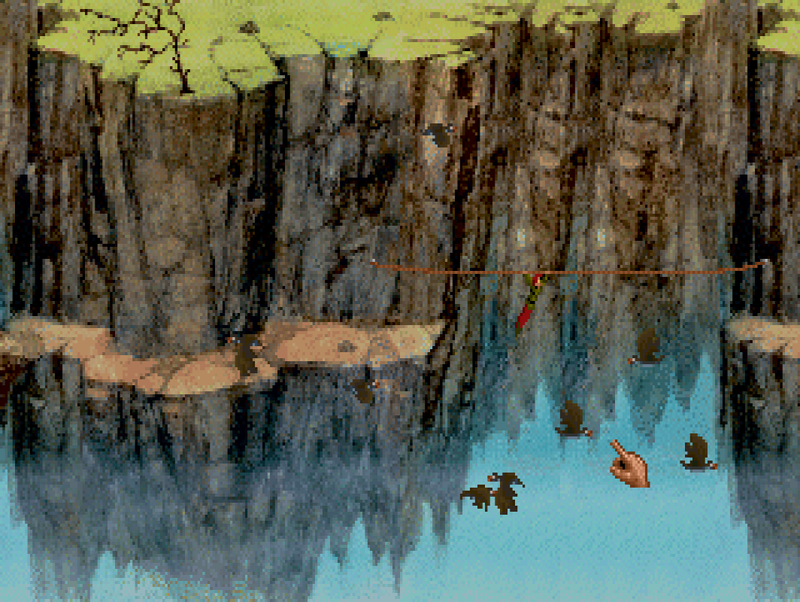 I cross the gap with the rope, take a few steps and… get hit by another falling boulder. 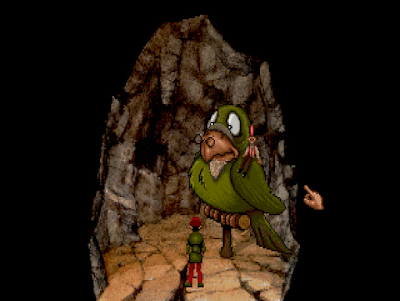 The pigeon takes me all the way back to the beginning of the path. I started my timer : it takes three minutes when you fall here just to go back to where you were a second before. THREE MINUTES. If it doesn’t seem much, you have to imagine the ordeal with this god-forsaken music and the fact that you have to be careful to avoid falling rocks, etc etc… Three minutes can be a long time, friends. JUST LET ME DIE YOU STUPID BIRD! I HATE YOU! LET ME GOOOO! Finally arriving at the end of the path, there is a sign written “Open Sesame”, which adds to my list of talk option (after Hi! And Help!) a third option saying “Open Sesame”. Brad’s digitized voice says something sounding like “Apinsmami” (but it’s 1992 so let’s be kind to digitized voice samples) and a cave opens in the cliff. I enter the cave and find myself in front of a nicely-drawn overgrown parrot with a guy on its shoulder. This joke would have been funnier if the guy was a pirate, in my humble opinion. And boom. 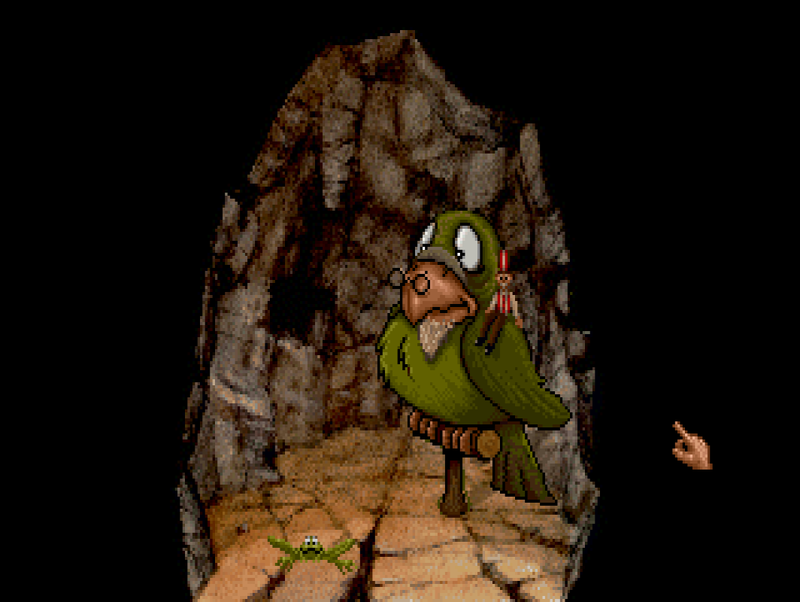 After all of this, it seems that I was lacking the items the parrot needed in the first place. Before becoming crazy, I went back to the seal, once again giving it money (which I hope is not in a finite quantity and I won’t run out eventually) and the seal only shows me the two last visions : the pig mask one and the costume shop one. I guess it means I actually made some progress and that the whole cliff part was not useless. Color me grateful. 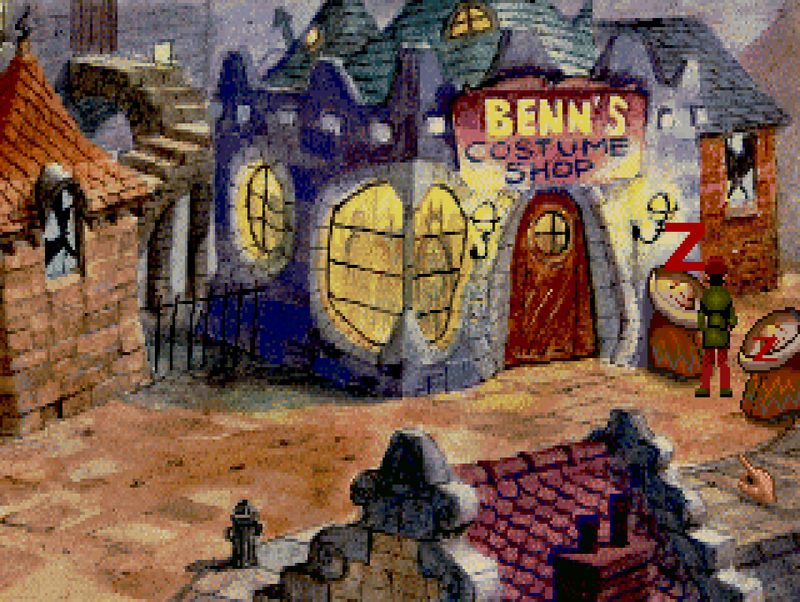 I then proceed to the costume shop, hoping that something different would happen and that I would find a pig mask. 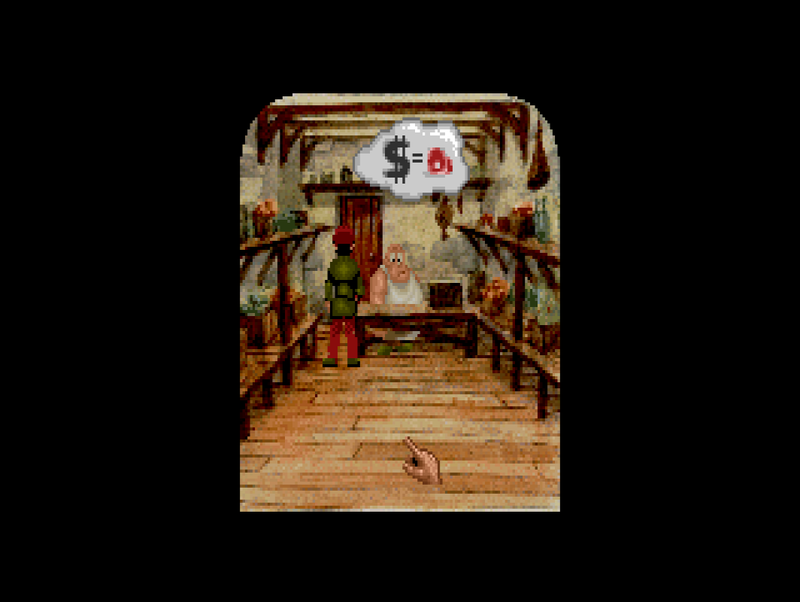 Sure enough, a merchant now appears and asks money for a dress. The item “money” has now been used on five different occasions. That’s game design for you. 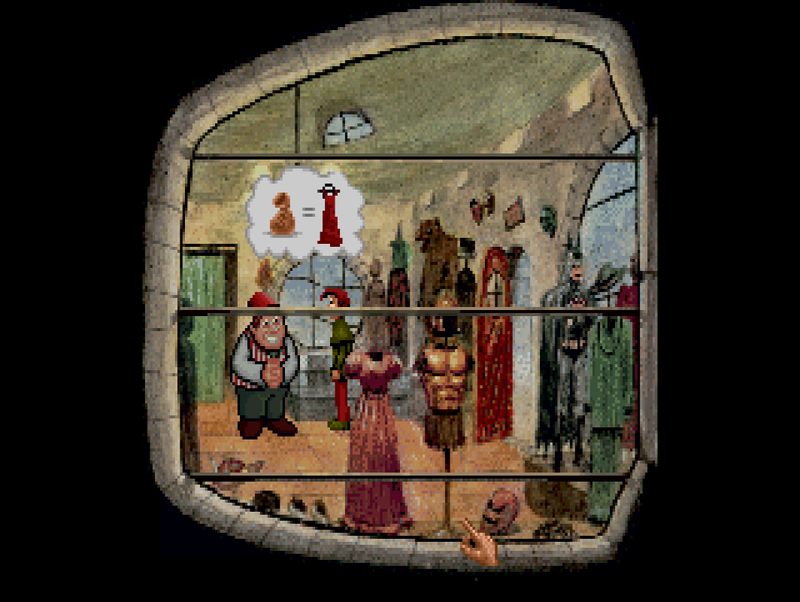 Overlooking the fact that the merchant looks like another stereotypical joke, I buy the dress, a bit disappointed it’s not a pig mask and of course go directly to the back room to try it out. Cross-dressing: the basis of 80’s and 90’s humour. And then, the door in the back room opens wide probably just because I wore a dress because why not. 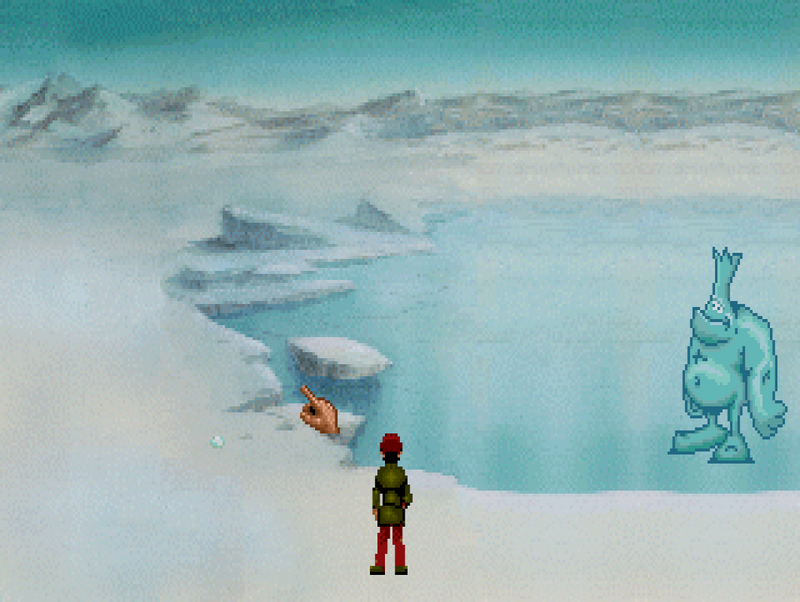 And then, entering it brings me to an ice wasteland with a yeti on a frozen lake. And then it’s time for me to quit this game before it sends me to the loony bin. Nice closet you got here.